How blogging can be an amazing vehicle to promote your business. Why blogging is still a great way for you to connect with others. How blogging can be a great resource for personal development and self-discovery. How you can use blogging to make an income by making recommendations. Why writing a blog can be less intense and stressful than writing a book . How the technology involved with blogging isn’t as complicated as you might think. 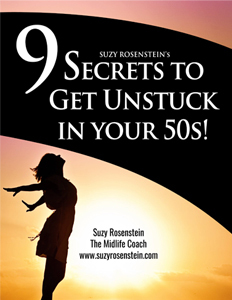 Why midlife women have access to a wealth of content as a result of their experience, age and stage. Why it’s important to find your own unique voice when you’re working on developing your blog. Blogging is something that many women in the middle say they want to do. Today’s episode features another interview in the Weekly Wow with Women in the Middle Series with someone who can totally help you finally get your blog off your to-do list. The Weekly WOW episodes introduce you to someone who’s got some pretty useful info for women in the middle. 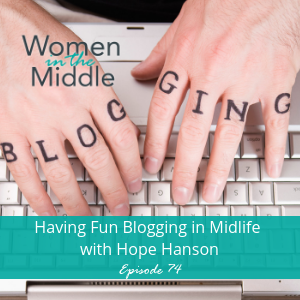 My guest this week is Hope Hanson who’s an expert in blogging. I’m pretty excited for you meet her because so many women in the middle are wannabe writers. Hope has been using blogging in her personal and professional life for almost 15 years. She basically went from someone who blogged in a therapeutic and personal way, to blogging to promote her business, to teaching other amazing women how to blog and help them earn a living from blogging. Hope recently started “The Purple Teacup,” an online blogging hub where women can go to learn how to build a blog to share their voice, ideas and business with the world. Hope shares the most common reason that so many women think about blogging but don’t ever start. Fear can get in the way and block you in a variety of ways. The other thing is that so many women tend to downplay what they have to say. Hope also talks about how important a blog can be to life each other up and a social support kind of way. Blogs can have a huge impact of the lives of complete strangers. Hope demystifies how to come up with content and deal with the technology required to start a blog. She explains why blogging can be the perfect way to share authenticity, help other women, make money, promote your business. It might just be the perfect time for you to start that blog you’ve been thinking about!